"Shady" McCoy is apparently not thrilled about going to Buffalo via trade. The National Football League free agency period doesn’t begin until the 10th of this month but already there has been one major shift on the League’s landscape. ESPN’s Adam Schefter reported yesterday that Philadelphia will trade LeSean McCoy to the Buffalo Bills for linebacker Kiko Alonso. The trade cannot formally happen until the 2015 NFL Season officially starts on the 10th. 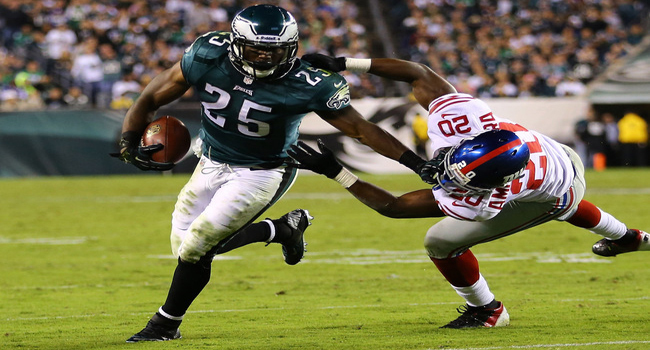 Should the Eagles have received more in return for McCoy than just Alonso? The easiest question to ask why didn’t the Eagles ask for more? Alonso has played one season in the NFL and while he was spectacular, it’s still one season which was followed by a year on injured reserve after he tore an ACL in his knee. McCoy on the other hand is an established star running back. Although he had a below par season for himself, he still rushed for over 1,300 yards but his receptions dropped significantly. In 2012 and 2013, “Shady” had 54 and 52 receptions respectively. Last season, he recorded just 28 catches. It’s no secret that McCoy was not exactly happy with things in Philly under Chip Kelly but we are hearing that he’s also not thrilled about going to Buffalo either. What the trade does for the Eagles is create cap space which is always important and it brings another familiar face to town for the former Oregon coach who will now have nine former Ducks on his Eagles’ roster. Don’t be surprised if Kelly does everything he can to make it ten. There’s been plenty of speculation that Kelly will try to trade up to grab Heisman winner Marcus Mariota. That idea has time to brew however. For the Bills, new Head Coach Rex Ryan gets a running back his offense needs because there’s shock when I tell you that Ryan likes to run the ball. The question for him though is this the type of back who runs between the tackles for three yards and a cloud of dust? That’s where I think there could be some issues. McCoy is much better suited to being in an offense more suitable to his skills which is something more like the Eagles. I think McCoy can thrive in just about any offense but I think that line of thinking is fair. Rex Ryan wants to win games 17-10 if he can behind a punishing defense and powerful running game. The fact that his Bills traded yesterday to bring in quarterback Matt Cassel is more proof of the style Ryan wants to win with in Buffalo. Now in terms of Alonso, he just wasn’t going to fit in Rex Ryan’s 3-4 defense. Now he goes to Philadelphia where the Eagles in a more traditional 4-3 alignment and he has the familiarity of playing for his college coach in Chip Kelly. The question for Alonso is what can we expect from him coming off of his ACL tear which by the way was his second one in his football career? Many players come back from these injuries and play at a high level and I see no reason why Alonso can’t do the same. If we peer into the crystal ball for both coaches it isn’t easy hard to see what’s happening with this trade. Besides creating more cap space, Chip Kelly brings in more of his “own” guys and gets rid of a guy who allegedly wasn’t crazy about playing for him. For Ryan it’s even more clear. He’s now on his second head coaching stop and most coaches are lucky t have even one shot. With that said, Ryan is going all-in to win now because a couple of poor seasons in Buffalo with the talent he has will surely be his final head coaching stop.